Firstly, I just want to thank the wonderful team at Blip Interactive! 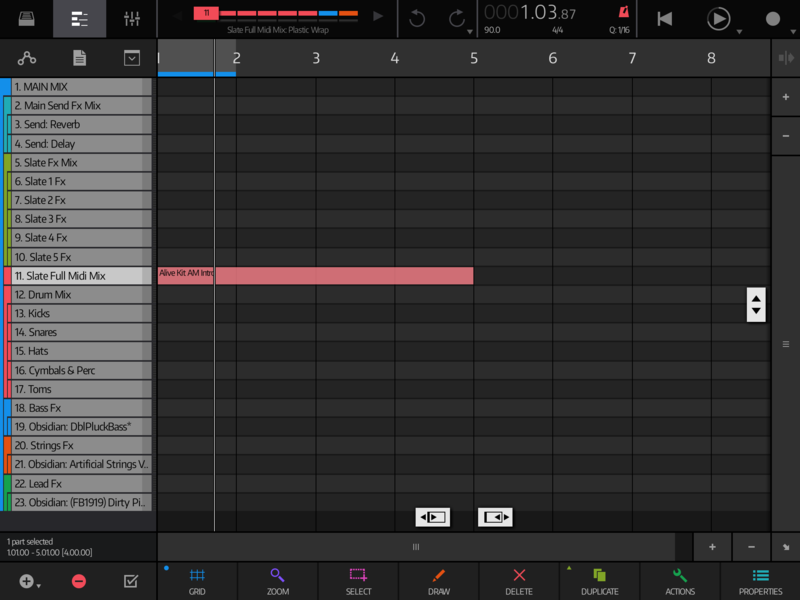 For the first time I feel as though iOS has a DAW that can compete with the big dogs!!! If I give a feature request it is in no way shape or form a complaint. I just want to help improve an already great DAW. Now for the feature request. Would love to see a way for us to be able to explode or separate a midi track the has multiple midi notes played. One good example would be for the Slate sampler. I often do my drums all in one midi track and it limits me in the end process of mixing. I just would like to see an easy way to separate midi tracks. on bottom "add track lane"
If you want to have separate MIXER tracks for each pad this is a little bit more complicated because Slate doesn't have individual outs. after this, do "init kit" for main slate - you will use it just for triggering all thise individual slates, somyou don't need any samples to hace loaded in it..
Now, your parent main slate works just like comtroller and every pad just sends note and triggers one of child slates. @mrwilson Yeah ‘explode’ pads would make a big difference for me in ns2 day to day use. Been requested in a few threads now so hopefully Matt will get on it. @dendy you are the man sir!!! Thanks a million! @flockz I hope this feature is added, will definitely improve workflow. I used to separate midi tracks in many DAWs, but splitting the midi can be problematic in other ways and now I’ve gone back to keeping my midi together in the same files for drums. I now prefer the suggestion that @dendy made of having separate drums sequenced from a main drum lane - it makes more complex fx configurations easier to handle. Also, as your request suggests, it’s much better to keep many drums separate for later audio mixing or song remixing. The pic above shows my template for running separate drum groups from the midi of one full kit. I also have separate fx tracks for each of the drum tracks, so that essentially I could change anything at a later date, even when I’ve exported and start working in audio tracks. I could still see use for an automated process that helps split midi though and I’m surprised I’ve not seen it in many DAWs. I do not use that "parent" slate at all. In my configuration that's just empty parent channel for merging audio together for applying some global FX on whole drum bus, or for sending whole drum bus to parallel processing channel at once ..
Now what is main advantage of such setup for me ? I can very easy experiment with, let's say different snare sounds, by just transposing notes in "Snares Slate" midi clip ! I like this workflow a much ! Yes, it’s finding the way of working for what you are trying to achieve - one way is never the right for all situations. As I said, I can see uses for splitting midi, such as you mentioned. There are also times when splitting midi is not the best option, such as while editing multiple lanes of midi at the same time, or using melodic sequences for drum variations. It’s really hard not to compare Slate with other daw pad samplers when using it and the possible results. No matter which way I come at it when trying to persuade myself it’s not too limited or inconconvenient for various uses, eventually I wind up feeling like I’m just deluding myself and questioning why I’m persevering. My main disappointment in ns2 probably. Good news is that most of the tweaks required are pretty straight forward. It’s really hard not to compare Slate with other daw pad samplers when using it and the possible results. I guess I’m mostly comparing to ableton racks, bitwig, b3, maschine....the more recent Daws I suppose. Also, In desktop it doesn’t feel like a daw necessarily needs to cover this stuff for themselves with an internal instrument as vst is so easily and completely intergrated. Like you can just buy something like Geist and load it with all separate channels available in the daw sequencer and mixer and also instantly drag and drop samples and clips from Daw browser and tracks straight to Geist pads.That kind of 3rd party convenience isn’t possible in iOS down to Apple making life so hard, so it’s even more important for an iOS daw to provide its own solution that stands up against those other ones elsewhere. Hey @Fruitbat1919 Thank you for explaining this! Is it possible that you can share your template (looks so nice and neat)? Been trying in another thread, but for some reason my Dropbox refuses to upload the file to share. Have you tried zipping it first? I thought that NS2 automatically zipped when archiving? I’m sure you knew this but Dropbox fails the first export if the Dropbox app isn’t already open. Works the second time. No I didn’t know that, thanks. @Fruitbat1919 you ARE the man!!! Thank you sir! Not related to the OP I know, but Dropbox can be strange like this. Sometimes it seems to be related to the folder you're currently viewing. I can't remember the exact error it gives you but it's something like 'unsupported file type' if my sieve brain remembers correctly. At one stage it was doing this no matter what I tried and I had to uninstall/re-install it to stop it being a naughty boy. Yep that’s the error. It did work eventually, but Dropbox always acts like an alien entity at times! You would have thought that since its only purpose is to share files, it would do that properly. Any thoughts on the user feature request? Exploding Slate pads to channels would be great. Pretty standard feature among similar modern daw environments and badly missed in Ns2.